The shooter-MOBA ride never ends in 2016. 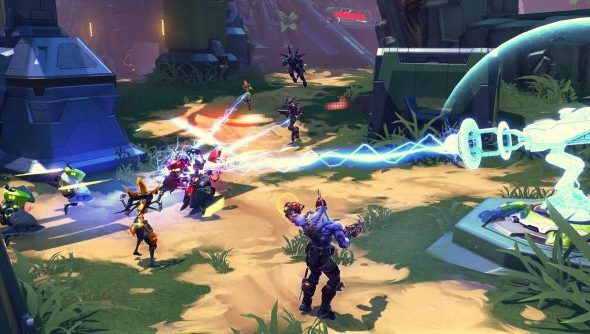 Battleborn will enter open beta on PC come April 13, with those on PS4 getting five days early access. It’s set to surprise people, as many seem to have locked into it as having more similarities to Overwatch than Borderlands, but the beta alone contains many more characters than the former and two Story Mode single-player/co-op missions akin to the latter. It’s also due to show off the 25-strong cast and three progression systems. Which from this pack of hero-based shooters will end up in our best FPS list? The game actually looks pretty fantastic. It’s all numbers popping out of enemies, cartoon art and jokes about the constant threat of death, which we’ve definitely seen before, but the designs of characters and areas are wonderful. I want to experiment in it and see how these guys interact. I don’t see it becoming my competitive mainstay, but I’ll certainly give it the time of day for a few days of free play. Plus, the setting is rad – last star in the universe? Cool. You can sign up for the beta on the official site, and here’s everything you need to know about timings in different regions. There’s also details on the missions and competitive modes you can take part in and the collection of heroes that will be available – some immediately, others to be earned.